Artificial Intelligence is a key component in creating a seamless customer service experience. With technology’s exponential growth over the past decade we are seeing AI bots search, extract, and record data faster than ever before. AI not only enhances the customer experience, but increases the output of human agents as well. However, even with the benefits AI can bring, many organizations still hesitate to transform their customer experience, leveraging the power of AI. 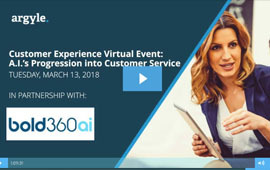 In this Argyle Executive Forum, in partnership with Bold360 by LogMeIn, we bring leading CX executives to discuss the value Artificial Intelligence brings to the table.